Dave’s Silver 1 pre amp. 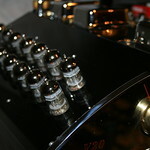 kingman wrote: Dave’s Silver 1 pre amp. A proper home for this Pickering XSV-3000. Finally found a Marantz SLT-12U for it!! Thanks Ray and Snoop! This was a basket case last week, a squashed stylus, plinth shifted off the base 3/8", dusty grimy, dried up grease in the bearing cup and grease on the scissor gears where there shouldn't be any. The base looked like it had some moisture damage but the grain was not raised. I spent all of Sunday going through it and fixing the tracking and tonearm lift problems, cleaned the wood and applied some Old English to re-color where the original stain was discolored. Cleaned up nicely!! I went from a H/K ST-7 to the Marantz SLT-12 about 2 years ago. The standard SLT-12 has a Shure V-15 MK-1 cartridge glued into the headshell (no 1/2" mount). I managed to find an aftermarket sapphire stylus (Zarifa) from a seller in France. It sounded better than my HK ST-7 W/Pickering XV-15, but it never had that low end 'groove'/musicality. Since switching to the SLT-12-U with the Pickering XSV-3000, I've got that mid/low tone back AND it's quieter/smoother. I don't know why this TT ever got such poor reviews; the platter weighs 12#, and the tracking is effortless when it's set correctly. To my ears it sounds great! I could see some people criticizing the tiny bit of wiggle in the tracking mechanism, but it does not seem to transmit to a resonance so maybe if there is any it's above the audible range.